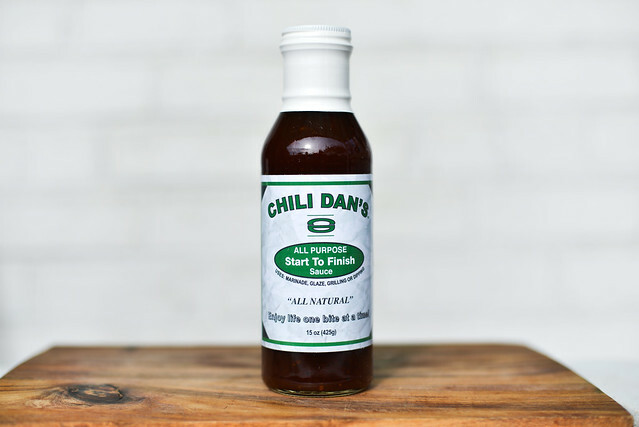 Chili Dan's is a great uncomplicated sauce that strikes a really nice balance between sweet, tart, and spicy, even if it doesn't do the best holding up on the grill. This sauce was graciously submitted for review by Chili Dan himself. That would be Dan Miller, from Erie, MI, who devised the sauce when his wife requested a warm and sweet coating for a batch of wings they were cooking up one night. A few peppers and other ingredients later, the base of Chili Dan's was born. 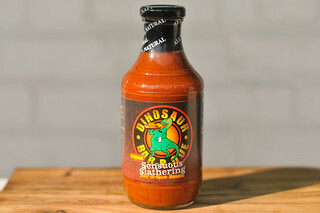 Since then, the sauce has been refined and is now bottled and sold via their website and stores in Michigan, Ohio, and Indiana. The initial aroma is a large waft of ketchup heavily spiked with vinegar. It's tangy and sweet, with a bit of spice as you take in a deeper smell. It's pretty straightforward and uncomplicated—the only addition that stands out here besides the tomatoes, sugar, vinegar, and peppers is a distinct oniony note. Chili Dan's has an orange-red hue that's semi-transparent, letting you see the plethora of spices that include black and red pepper flakes. It runs on the thin side of medium and has a very smooth texture and glossy look. It pours in a quick and steady stream off a suspended spoon, leaving only a light coating left clinging to the silverware. The flavor starts out as sugary sweet. This doesn't last long as the tartness of vinegar starts to mingle and create a nice sweet and sour character with the flavor of tomato ketchup in the background. As the sauce settles in on the tongue, the vinegar becomes stronger and the spices start kicking in. First you get a taste of onion, followed by heat from peppers. 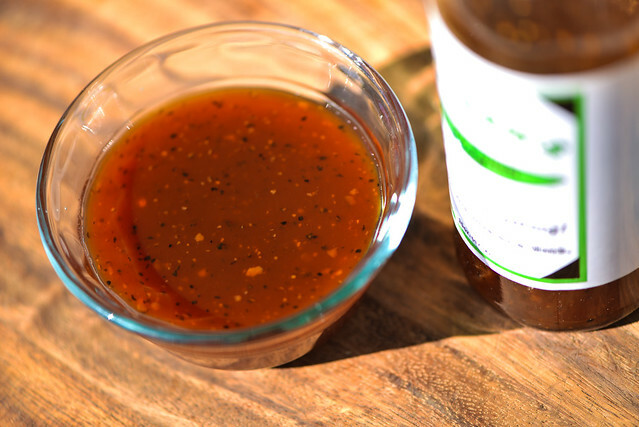 The punch of habanero dominates at first, but as the sauce leaves the tongue, strong pockets of black pepper inflict their bite. The sauce leaves the mouth with a bit of a burn along with hints of its sweet start still lingering. This sauce coated the chicken very lightly, and while it did bake in well, it never built up a heavy layer of sauce despite extra brushings. Over direct heat there was some attractive caramelization, giving the chicken more color than the sauce was able to do on its own. Unfortunately the light coating translated into light flavor as well. There was a pleasing play between sweet and tangy, with the heat mellowing out compared to its potency out of the jar. Chili Dan's doesn't brand itself as a barbecue sauce, but rather an all purpose sauce, and I buy into that. 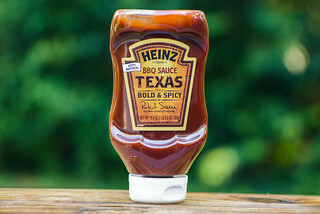 It certainly ticks many of the barbecue sauce boxes—tomato, ketchup, vinegar, and chilies—but it doesn't have the depth of many other barbecue sauces that take things further with Worcestershire, molasses, etc. This is in no way is a bad thing. In fact, the uncomplicated flavor reminded me of one of my favorites, Bone Suckin' Hot. 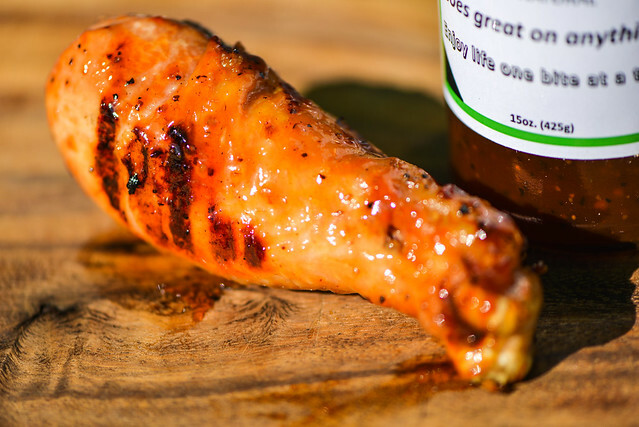 At the same time, it didn't preform as well on the grill as a many sauces designed for that specific task tends to do—the coating was too light and didn't pop, even against the mild flavor of chicken. I really loved the sauce out of the jar though and think it would be an excellent condiment for so many things—burgers, fries, wings, etc. Chili Dan is the man, he sent the Meatwave a second bottle of sauce to give away to you all. To enter to win this bottle of sauce, comment on this post with what's going on your grill this Thanksgiving (or oven if you're not grilling). Deadline for entries is 11:59pm on Tuesday November 12, 2013. Read the official rules for more details. One entry only per individual. Good luck! 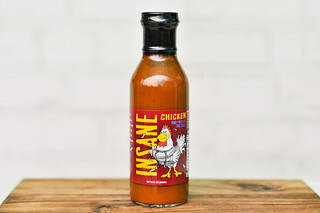 I have personally tasted this sauce and it is fantastic! Like the name of the sauce implies it really can be used for anything. It's a must have in the kitchen when your taste buds are looking for that special kick for dinner or snacks. This sauce is great. My family uses it like A1 sauce for dipping. My daughter will not eat steak or pork chops without it now. Perfect all around sauce. Well, we had a record-breaking amount of snow on Tuesday - it's cold and I don't think I'll be grilling this Thanksgiving. I will be putting a turkey breast in the oven along with all the typical things. However, I am a BIG griller and once I get moved to AZ - I'll definitely grill year 'roung!! This sauce is great with just about anything! I frequently marinate my steaks and shrimp with it, the most excellent shrimp I have ever had was marinated in Chili Dans sauce for about 2 hours! I also dip my Mozzarella Sticks and French Fries in it, makes a good alternate for ketchup. It's also really good with brown-n-serve breakfast sausage. I put it on taquitos and chimichungas/burritos all the time. I also put it on ham-n-cheese loaf sandwiches. When having boneless chicken breasts, I love to dip each bite in the sauce. As for Thanksgiving, having 3 ducks and a small turkey (all in oven). Usually have 2 ducks and a large turkey, but duck is so damn good, gotta have more of it. Along with that will be turkey gravy with mash potatoes, candied yams, Hawaiian sweet rolls and corn bread with cream corn in it. We'll probably go with a standard brined/roasted turkey. I've smoked turkeys in the past, but I think I prefer a traditional roasted bird for the holidays. I will be putting a turkey breast and a small ham on the smoker for Thanksgiving. I am sure that this sauce would go great with thosw items. What goes on the grill for Thankgiving? Everything! From butterflied turkey to getting some nice grill marks on the sweet potatoes. Deconstructed turkey, and grilled veggies for the stuffing. YES! This contest is closed. Congrats to Jeff for winning the sauce. Thanks Meatwave and to Jeff, please let me know how you like the sauce and what you used it on. Well I missed the contest but it sounds like a useful sauce for several applications.